These lenses are thicker at the edge than in the centre and flat on one side. The plano-concave lenses are used to expand light beams or to increase focal lengths in optical systems. They are often employed for beam expansion of high peak power pulsed lasers. A beam incident on a concave surface will be focused to a point outside the instrument. Air heating and ionization at the unwanted focal point are possible with attendant mode disruption or material damage. 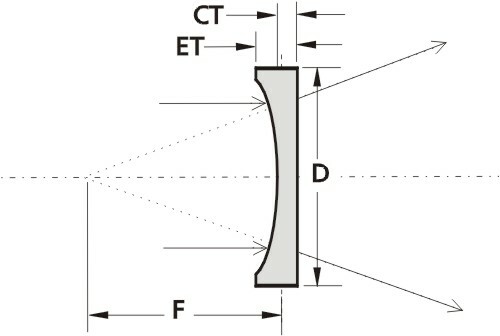 To avoid this problem, the input lens should be reversed so that no concave surface faces a parallel beam.